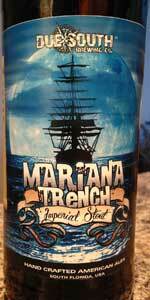 Home Beers Due South Brewing Co.
Mariana Trench | Due South Brewing Co. Poured at 51°F from a 22oz bottle (2016 vintage) into a Spiegelau stout glass. Consumed on 20Jun16. LOOK: Pours with three fingers of cinnamon-colored foam. The head changes color to khaki within fifteen seconds. The massive foam head finally levels to a half fingers worth within three minutes. Black in color with orange luster. There is a moderate amount of tiny rising bubbles. Lacing is high in quantity and both thick and very thick. SMELL: Strong sweet chocolate and vanilla entangle with mild molasses, raisins, bittersweet coffee, toffee, caramel, subtle alcohol and bitter roasted malts. TASTE: A strong sweetness is welcomed as flavors of chocolate and vanilla caress the palate. Sweetness is simultaneously balanced and amplified as mild molasses, raisins, and bittersweet coffee flavors immediately roll out. An additional sweetness is presented as mild toffee and subtle caramel flavors step on to the palate. The taste symphony closes with mild flavors bitter roasted malts and subtle flavors of alcohol as caramel grows slightly stronger while all other flavors persist. FEEL: Full-bodied with hints of carbonation. Goes down incredibly smooth and creamy. Clings to the back of the throat like syrup. Finishes with a strong and unpleasant dryness. A strong and welcoming alcoholic warmth can be felt as it travels down the throat. NOTE: An Imperial Stout whose aroma leaned towards the sweet and unbalanced side of the spectrum. I was hoping the taste would follow, but I found more of a balanced brew. The bitter roasted malts and alcohol flavors definitely kept the sweetness at bay. Overall, this is a wonderful offering from Due South and a great first impression. Big creamy fluffy 1 finger mocha head, fades slowly with nice lacing, super dark pitch black color, nice legs. Nose super chocolate, creamy mocha java, milk and fudgey cocoa, some roasted coffee, candied caramel, toffee, milk duds. Taste big cocoa again, dark choc and cocoa fudge, creamy milk choc and milk dud candy, little caramel candies and toffee, chewy nougat like, with spicy earthy hops and fake fair bitterness, some mild vanilla in the background, even a touch of candied raisin. Finish dry very bitter spicy hop, dark cocoa roast, little coffee and vanilla. Mouth is thicker fudgey bod, nice carb, very little booze. Overall pretty nice for imperial stout. Very little booze, nice hop level, nice cocoa and vanilla etc, enjoyable. Pours a deep dark chocolate color with a light mocha head. Has minimal aroma of cocao and roasted malts. Flavor is chocolate with a light creamy sweetness. Body is smooth with a bit of crisp carbonation. Overall a really nice stout. Mariana Trench from Due South Brewing Co.